Hey there Freaky Darlings! working out of a funk is hard work! I’ve got three more interviews left from Fatality Fest to show you. This next one comes from possibly one of the nicest guys I’ve met on the convention circuit. Not to say he’s the only nice one, but that is definitely the first thing that comes to mind when you meet him. Mr. J. Larose it is! Fantastic finally getting to sit down with him. He was one I always promised I would make it to him and get him on the site. I met his some years back at a show when all he really had under his belt was Saw 3. We had just met Shawnee Smith and walked past his table when he just kind of flagged us down and started chatting. We do look interesting in public! He was very nice. He signed us an autograph with the most words I’d ever seen a celeb write and was just pleased to chat with a fan. Flashing forward 6 years, here I am at Fatality Fest and there J is…i got my chance. Let’s get into this baby huh? The nicest guy you’ll ever meet! Malice Psychotik: I want to ask you first about Saw 3. How did you come across the role? Did they find you or did you seek it out? J. Larose: Actually the Director of Saw 2, 3, and 4, Darren Lynn Bouseman, I’ve known him for many, many years. He came out of Full Sail Film School around the same time I started dabbling in acting. I auditioned for a student film he was doing on his way out of school. He cast me in the lead of this short he was doing and we just became fabulous friends. We are like brothers, talk everyday type thing. Then he moved out to LA. spent some years struggling out there till he hit it big with Saw 2. He couldn’t really bring me in on Saw 2, because he was a nobody at the time. Then when they offered him Saw 3, he introduced me to the producers and that kind of got my foot in the door. They OK’d me, and I worked really hard to make it good. I didn’t want to make him look bad, like they made the wrong choice. The scene came out brilliant and that’s how that all came about. M: The makeup job for that scene was fantastic. Did you have any pain or difficulty when you put it on. I know the loops in the limbs were probably easy to do. But that mouth one looks like it couldn’t have been that pleasant to have on. J: The makeup artists were brilliant on the film. I believe they have done all of them if not most. They’re just true artists. The jaw piece was actually fairly simple. One end connected to my jaw and the other end, it was like a C hook, fit in my mouth. But they coated it with rubber and tried to make it as comfortable as possible. After 10 hours in my mouth it was bit irritating but it looked awesome. Everything else was just real practical. No CGI. It was a bit creepy. I remember looking down, it was about a 3 and half hour makeup job with two people working on me, and I look down and see the ones in both my heels. There was like a flush came over me because my brain is telling me “that should freaking hurt!” and it doesn’t. So I got a little teetery on that one. M: And that is how you know you have a great effects artist! Plays with your head! Moving on, let’s talk about Repo! 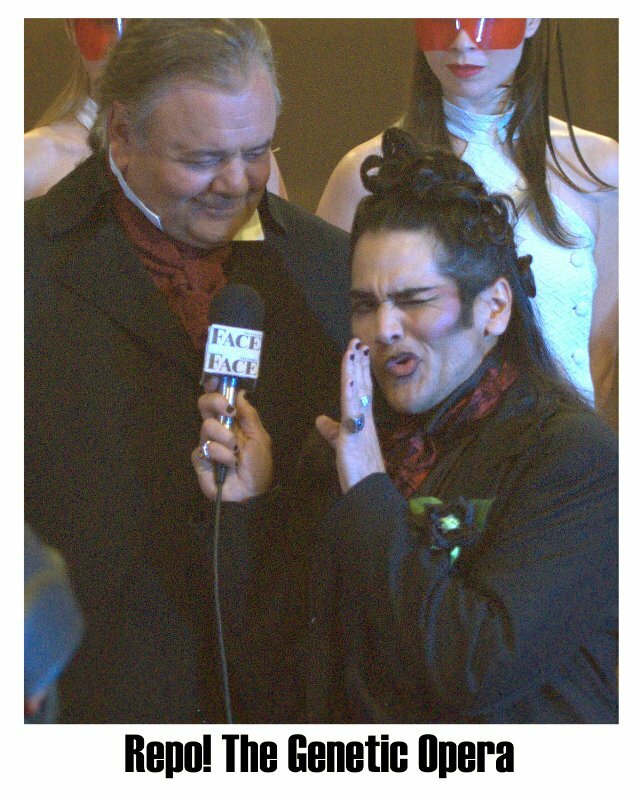 The Genetic Opera. I remember hearing about this and you were supposed to play Pavi Largo. Why did things get changed? J: Originally we had done a trailer for it. Darren still had access to some of the crew. We had done him a favor and did a trailer for Repo! To kind of get some finance for it and show them what it was. So at the time I did the Pavi role. It was a far cry from what it ended up being. I kind of looked like Michael Jackson…after the surgery. Of course it’s a rock opera, so they were trying to bring in people from the music business to get attention. Somehow they had access to Ogre from Skinny Puppy, and he ultimately ended up playing the role. I was a little disappointed that I didn’t get to play him, but I totally get it. A musical is hard to get going as it is and he brought this whole fan base with him. He’s really great we ended up becoming good friends. It’s a great project though. It’s something I’m very proud of, even though I have a very small role. It’s still a gas and I’m proud to be a part of it. M: Next I’m going to talk about Insidious. I’ll go ahead and be honest, I was not a big fan of that film. I think the over-hype killed it for me. But I will say your ghost in that movie was the most impressive. At least scarier than the main one. What went into that role? M: Will we see a return of the big bad fiend in Insidious 2? J: I don’t know man. we will just have to wait and see. I know it comes out in September so..
M: Let’s talk…Devils Carnival. I’m loving this film. I can’t wait for the next one. You don’t get to see much of your character, but I’m very interested in more. Care to talk a little about it? J: Well it’s not really meant to be a one shot thing. There are going to be other parts to it. I’m part of this Carnival. I’m the band leader. Every Carnival has a band right? Well I’m the leader. It’s a background character, but it’s part of the family. I’m hoping one day I’ll get the main stage as they make more. I keep digging at Darren, “Come on give me a song in it!” It’s real fun though. I got to wear this awesome mustache and a uniform. AND I got to direct the band, so it’s all good. Does interviewing the interview-er from Repo! count as inception? M: Last I heard, Devils Carnival 2 was still seeking funding. Any word on when that project is going to move forward? J: I’m not really privy to all of that. I’ve heard a few things. It’s all about funding though. It always comes down to the money. Also it’s more a passion project than it is a business one. Terrance and Darren have to make time for it too. They have that and meanwhile have to continue doing feature films. All the other people also are doing this out of love for the project. They aren’t doing it for the money. Their isn’t really any money involved. So you have to coordinate all of these peoples schedules too. It’s a scheduling challenge/nightmare as well. M: Do you have anything else coming up that we should keep an eye out for? J: I actually had a bit of a disappointment recently. I was supposed to be in this film Now You See Me. Kind of a heist film, not horror related. I saw that my scene was cut out! I still got like a second of screen time. Sort of a background thing. But the director, awesome guy, he reached out to me ahead of time. He told me they had to cut time and he just wanted to give me the heads up on my scene. It’s going to get a release on Bluray so it will eventually be able to be seen. I still got to work with Mark Ruffalo, and it was such a pleasure. I’m such a fan of his work. I shot something last year called Wind Walkers. 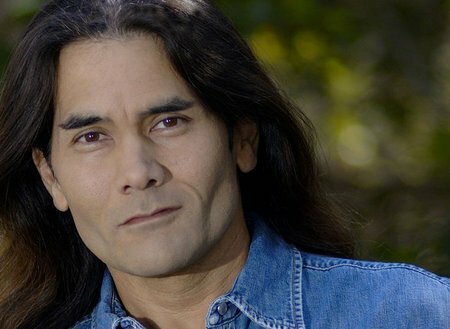 Sort of a spiritual type Native American movie. That was a blast. Really Great script. I think that one is in post-production right now. I’m working on a film right now called Paymon. Sort of a devil/ghost horror movie. More ghosty than horrory. Anthony DiBlasi is directing that. He’s done stuff like Dread and Midnight Meat Train. I’ve worked with him before and he’s a great guy. We right in the middle of production right now. So it’s a bit early to tell when that one is coming out. That’s kind of what I got cooking right now. Isn’t he great guys and ghouls? Such a talented guy and humble as hell! Always a pleasure meeting this guy. You see him at a con, you be sure to stop by and say hello. Most appreciative of his fans indeed and never disappoints. Be sure to keep an eye out for more interviews. Been a long time since June, but life has a way of turning things upside down. I have a lot more in store for you all in the month of October. You won’t want to miss a beat!